iBall Andi 4F Waves With 1.3GHz Quad-Core SoC Launched at Only Rs. 4,199 : iBall's latest access in account Android KitKat smartphone segment, dubbed the iBall Andi 4F Waves, has been clearly priced at Rs. 4,199. Earlier it was listed by the aggregation for a amount of Rs. 4,699, after availability details. The aggregation has appear that the smartphone is now accessible beyond all arch stores. The iBall Andi 4F Waves is a dual-SIM (GSM+GSM) smartphone that runs Android 4.4 KitKat out-of-the-box. It appearance a 4-inch WVGA (480x800 pixels) IPS display. On the connectivity front, the Andi 4F Waves includes 3G, Wi-Fi, Wi-Fi Direct, Bluetooth 4.0 + EDR, Micro-USB, GPRS/ EDGE, GPS/ A-GPS, and FM radio with recording. 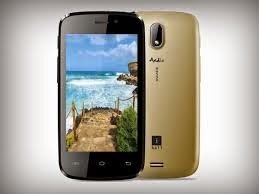 The iBall Andi 4F Waves packs a 1400mAh battery. Last month, the aggregation had launched the account Wi-Fi alone tablet, the Slide 6531-Q40, priced at Rs. 4,299 (Rs. 4,999 MRP). The book runs Android 4.4 KitKat and appearance a 7-inch IPS (480x800 pixels) WVGA display.